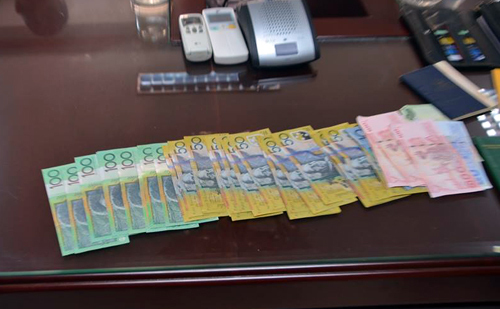 Police managed to retrieve and return the items, including AUD2,350 in cash. Police in Ho Chi Minh City have detained a Vietnamese driver for appropriating a bag left in his car by an Australian passenger. Grabcar driver Ho Van Khanh, 22, allegedly took a bag containing AUD2,350 ($1,860), three passports and a credit card for himself, after discovering that his passenger had accidentally left it on the back seat, according to Thanh Nien newspaper. The cash police retrieved from Khanh. Photo by VnExpress/Nhat Vy. Matthew Grieve, 48, reportedly called Khanh's Grabcar to go to Tan Son Nhat Airport for their flight back to Australia on Tuesday afternoon. Upon trying to check-in, Grieve discovered that he had left all passports and cash in the car, preventing his family from boarding their flight. Since Khanh didn't return any calls, Grieve decided to report the incident to the police. 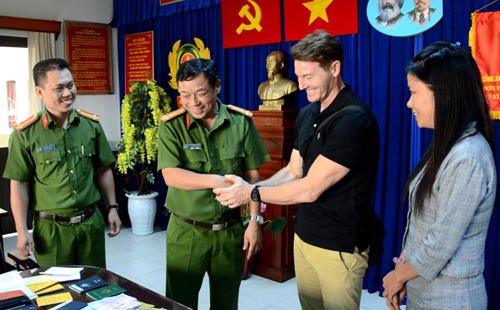 Police quickly detained Khanh and successfully retrieved Grieve's lost money and documents, which were returned to him on Friday. Police returns the items to Grieve. Photo by VnExpress/Nhat Vy. Khanh claimed he only discovered the bag after leaving the airport, and decided to keep it for himself thinking that its owner had already left the country.